Niamh Mannion for the Food and Wine Blogging event tickets. My Favourite Things for the Good Fats, Bad Fats tickets. Please can you make contact with the LitFest box office (info@litfest.ie) ASAP and give them your name, email and address so they can send them out to you! LitFest 2014... just around the corner. WIN TICKETS! Oops, it's been a busy couple of months... and can you believe it, it's almost that time of year again! 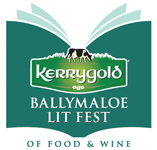 The KerryGold Ballymaloe Literary Festival of Food and Wine is just around the corner. This year it's on the weekend of May 16th-17th-18th. We'd love to see you there... WE'RE OFFERING PAIRS OF TICKETS TO TWO EVENTS, so be sure to read on for more. Simon Hopkinson, Alys Fowler, Sally and John McKenna, Donal Skeehan, Catherine Fulvio, Rachel Allen, Tom Dorley, John Wilson, Thomasina Miers, Paul Flynn, Maggie Beer, Mary Dowey, Jill Norman... some of the giants of food and wine literature. We have discussions, readings, writing workshops, a food trail and walking tour as well as cookery demonstrations galore. Tickets to Yotam Ottolenghi and Sami Tamimi's demonstration and pop-up dinner sold within minutes of going on sale. As did the foraging walks with Rene Redzepi of Noma.... but you can still (at time of writing) catch him in conversation with John McKenna on Saturday morning in the Grainstore... but tickets are selling fast. If you were longing to learn about Middle Eastern flavours then Ariana Bundy's cookery demonstration with Rory O'Connell is not to be missed. She will be sharing recipes from her delectable book, Pomegranates and Roses. Another couple of cookery demonstrations which are selling fast are grande dame of Mexican cuisine Diana Kennedy who "did for Mexican cooking what Julie Child did for French cuisine and Marcella Hazan did for Italian." And don't miss our home grown heroes, Ross Lewis and Rachel Allen, who will be doing a demo together. If you're a writer or aspiring writer then our Food and Wine Blogging discussion will be right up your street. Or perhaps the all day Food Writing workshop run by the staff of UCC’s MA in Creative Writing... which just has a couple of places remaining... and is a steal at just €10! And whilst we love to talk books, we also relish debate on the hot topics of our time: Forgotten Skills Making a Comeback and Good Fats vs Bad Fats- The Big Debate are just two of the many discussions for the discerning foodie. And that's just the beginning. With over fifty speakers from home and abroad touching on all aspects of food and wine, as well as our Big Shed Fringe event, it promises to be a weekend to savour. For a full listing of events, and to book, check out the Litfest.ie website. To be in with a chance to win a pair of tickets to EITHER the Food and Wine Blogging OR Good Fats Vs Bad Fats event, just tell us in the comments section below which event you'd like to attend... and which food hero you'd most like to meet in real life! Please ensure that 1) You are free to attend the LitFest event and 2) That you check back here on 30th April to see if you've won. Winners will be announced that day and must make contact with us within 48 hours to secure their tickets.